Scorpions AND SNAKES CONTROl Services - United Cell For Pest Control Services Est. Scorpions are arachnids, close relatives of ticks, mites and spiders. There are approximately 1,300 species of scorpions worldwide, characterized by an elongated body and a segmented tail that is tipped with a venomous stinger. 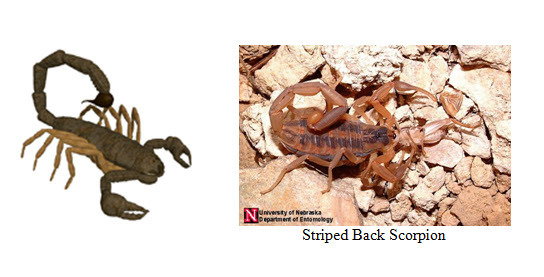 Most of the scorpions are not poisonous, except fro 2 species found in the southwestern states of the United States. Scorpions are commonly thought of as desert animals, but in fact, they occur in many other habitats as well, including grasslands, forests and caves. Scorpions have long, slender body with a 5-segmented tail that be arched over the back. Scorpions vary between species, but most measure about 2 inches fully grown. The color can vary widely between yellow, blue, reddish brown and black. Most of the scorpions that enter dwellings are not poisonous, their stings like those of bees or wasps. Scorpions have an interesting mating ritual. The male grasps the female’s pincers with his and leads her in a courtship dance that may last for several hours. The exact nature of this courtship dance varies from one species to the next. In general, the male deposits a sperm packet and maneuvers the female over it. The sperm packet is drawn into the female’s genital opening located near the front on the underside of her abdomen. The female stores the sperm packet, and the sperm is later used to fertilize her eggs. After mating, unless he is quick and able to escape, the male is often eaten by the female. Once the female is impregnated, the gestation period may last several months to a year and a half depending on the species. A single female may produce 25 to 35 young. Scorpions are born live and the young climb on to their mother’s back. The young scorpions remain on their mother’s back until their first molt. They assume an independent existence once they leave their mother’s back. Scorpions molt five or six times until they become full-grown adults. Scorpions generally hunt at night and use their stinger to paralyze prey. However, if the scorpion is strong enough to overpower its prey, instead of injecting its venom, it will simply hold the prey and eat it alive. This conserves venom, which can take up to 2 weeks to regenerate, during which time the scorpion’s main defense is inactive. Outdoors during the day, scorpions hide in burrows or debris, under woods, stones, or tree bark, and under floors of buildings in crawl spaces. Indoor scorpions may be found in cracks and crevices of woodwork, behind baseboards, in closets and attics, and inside walls. Scorpions gain entry into buildings through poorly sealed doors and windows, cracks in foundation, attic vents that are poorly screened, and through plumbing and other openings. The sting of most scorpions is not serious and usually results in localized pain, some swelling, tenderness and some discoloration. Systemic reactions to scorpion stings are rare. Scorpions are nocturnal, predatory animals that feed on a variety of insects, spiders, centipedes and other scorpions. They survive without feeding for six months. The larger scorpions occasionally feed on vertebrates, such as smaller lizards, snakes and mice. Preys are located primarily by sensing vibrations. Although they are equipped with venom to defend themselves, scorpions fall prey to many types of creatures, such as centipedes, tarantulas, insectivorous lizards, birds (especially owls) and mammals (including shrews, grasshopper mice, and bats). removed and is highly recommended for long residual activity. with insecticide and dust soil or ground with powder chemical.